Lucy Schwartz opened for The Weepies at Winston's in Ocean Beach, San Diego on Wednesday the 13th of October. Her flowing melodic femininity was an immediate refreshment in the small sold-out venue. A sea of 20, 30 and 40 somethings were mesmerized with this emerging songstress, only 20-years old, with an innate musical talent far beyond her years. The mellow and mostly female crowd appreciated the short but perfect set that set the cheerful tone for the rest of the night. A few minutes before hitting the stage, The Weepies created a whimsical moment with some bubbles - always a welcome idea. They finally went on around 11 pm, the somewhat restless looking crowd couldn't have been more ready for their mellow pop-folk sound. California duo Deb Talan and Steve Tannen truly imparted upon the crowd their likable chemistry through a display of fun melodies and relatable lyrics. They had a son together 3 years ago, affectionately referencing him between songs in a gesture that shed some light on their well-crafted tunes that clearly came from the heart. they make it seem effortless to be so real. The soulful sound carried smoothly throughout the crowd, creating a sense of happiness that made everyone want to keep swaying along and listening intently. The Weepies met in a Cambridge folk club 9 years ago and haven't toured since 2006. Welcome back guys, it's great to have you on the scene again. Their show was reminiscent of a condensed version of a romantic comedy, since they sang like a true life soundtrack. Lucy Schwartz and The Weepies complemented each other very well. This was the perfect way to spend a girl's night with a good friend; nothing beats great live music at a local beach club, a couple of drinks and quality time out of the house. 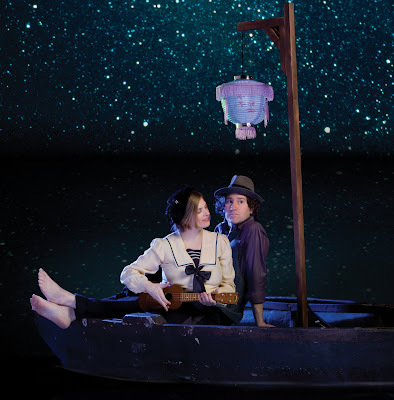 Connect with the weepies at www.theweepies.com and be sure to visit www.lucyschwartzmusic.com to stay in the loop with Lucy. Thank you again Rosey at www.sddialedin.com for the tickets to the show! Great article by Melanie -- all of her observations were spot on. I was at the show and couldn't agree more with her. Thanks Faith, it was so much fun being there with you. We need to attend shows together more often! We could be a review writing duo.